Hey everybody, sorry for no weekend post, got a little distracted by everything including a dying dryer. Anyway, I couldn't get Marvo to do another Candy Draft despite several attempts, but that doesn't mean that I can't talk about some new candy bars along with announcing episode 91 of the Nosh Show. Mmmm, it's candy time! Disclaimer: I did a terrible job with photos here. I left out the worst ones. My apologies. (1) I tried the Reese Peanut Butter Cup with Reese Pieces Big Cup first and it was love at first bite. It tastes like the reeses pieces tweak the flavor but more importantly add a bit of fun crunch to a product I already love. I'm more than happy to devour this fun variation. OSC: mmmm, very tasty, very fun, maybe a little much sweet reeses pb pop for some people but a neat change of pace for others. As discussed on the show: the running theory is that the Big Cup version of these is better than the regular cup version. (2) Instagram seemed pretty curious about the Snickers & Hazelnut so I tried that on day two and I'll describe it with one of my current favorite words: "weird". The hazelnut isn't strong, instead it's an inserted note in to a regular snickers candy bar. It's probably why they call it snickers & hazelnut instead of something like hazelnut snickers. Regular readers know I'm not a big fan of hazelnut, so to take that unique hazelnut note and consistently insert it in to every bite makes for an odd treat to me. I just didn't like it. To me it feels unbalanced with the peanuts. Maybe I just don't get what they were going for other than some social media traction (aka it's a gimmick). (3) On the third day I thought the Peanut Reeses Pieces were calling my name. A quick check of the nutrition panel reveals that the bag is two 200 calorie servings which leads to the question: can I manage to only eat half the bag? I dug in and did enjoy them more or less, but they are no peanut M&M's. I miss the balance between chocolate and peanut butter. 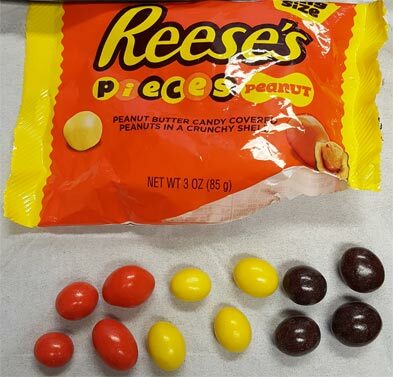 That unique Reese Pieces peanut butter just doesn't have that same flavor profile magic when mixed with a peanut. (4) Now I know I've had Milky Way Dark before, but I think I've only had them as though bite size Halloween style ones and not the full size candy bar. I take a bite and it's surprisingly dry. I wasn't expecting that from this candy bar (but it does taste familiar from trying the little ones). I'm not sure how I feel about it really. It says vanilla nougat but to me it just tastes like marshmallow. 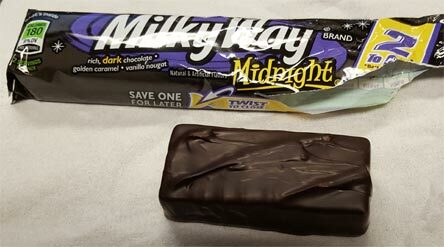 I appreciate that it's very different from a regular milky way, but I don't know if it's personally clicking with me. (5) Some say it can be "too early" for candy, but I say these people are crazy. Morning, especially Monday mornings, are a great time for candy. I grab one of the two bars inside the Big Kit Kat package and snack away. It's very much like a regular kit kat, just heftier. It feels heftier in your hand and as you bite, but the ratios all seem to be intact. I'm digging the familiar flavor profile in this denser former. For the record, I'm pretty sure I've tried these before and we'll be buying them again as well. 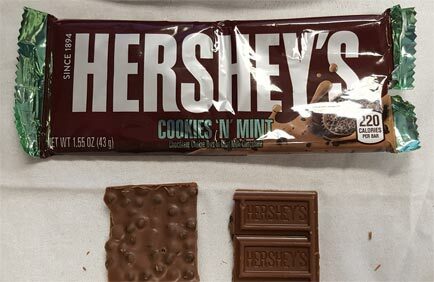 (6) It's Tuesday, mid morning, and I think I'm ready for Hershey's Cookies 'N' Mint candy bar. If you've had the little Hershey's cookies & cream blocks before then you will be familiar with the texture here, it's just now it has a mint kick to it as well. To be honest, I'm not sure how I feel about it at first. I adore peppermint patties, but now we've got that gritty cookie texture kicking in so that changes things up a good bit. If anything, I kind of want one of those amazing mint C&C shakes that has that middle layer of cookie crumbs right now. If this interests you, give it a whirl. 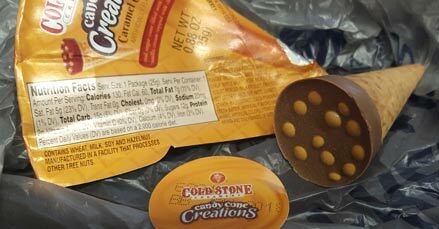 (7) And now it's Nosh Show Monday and all I have left in the candy bar snack bag is the Cold Stone Creamery Caramel Crave Candy Cone Creations. Wow that is a long name. I forgot to mention that all of the candy I have presented today was bought at Walmart in a single trip. I did check every aisle to see if these cone creations had any other flavors (plus I was searching for Twix White). The most important question is whether or not the cone is crunchy and I am happy to report that it is. This is something akin to finding fudge in a tiny sugar cone so it's a pretty novel idea and it's hard not to give props to that. Those beige "drops" you see on top? Actual candy coated bits akin to mini M&M's. Now do I taste the caramel? or the vanilla center? Not a ton, though there is a linger aftertaste of something akin to caramel. The disproportionate amount of milk chocolate does dominate everything. Still, it was a neat little treat but be warned, they do use hazelnut paste for some reason, so be careful if you have allergies. Ok, this has gone on long enough. I hope everyone has a great Halloween and a good week, or a good Halloween and a great week, you pick. 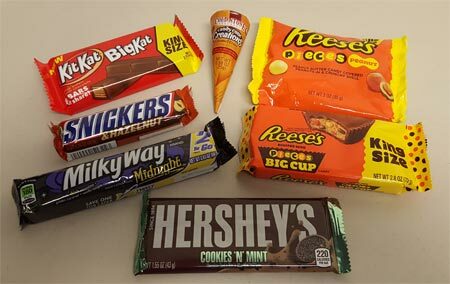 Let's part with the question: which of these seven candy bars do you prefer or hope to try soon? I'll be looking for the Cookies & Mint bar. I believe Hershey's has a bite size version similar to these that they release with the Christmas candies and I really like those. I'll try the Reeses cup too.